Congrats to Orangebird for guessing that Felipe Lopez was the first player to hit two home runs from both sides of the plate on opening day? However I am going to stop my trivia for a little bit. great. Then came September. The Mets were afraid of having yet another meltdown and that is exactly what they did. Closer, Billy Wagner was hurt and the Mets bullpen cost them from a trip to October. The Mets are a different team from the last two years. They completely redid their bullpen with the additions of Francisco Rodriguez and J.J. Putz. They also made some changes in the rotation with the additions of Freddy Garcia, Tim Redding, and Livan Hernandez. New York signed Alex Cora to be their utility infielder. Then resigned Oliver Perez. Only of few days ago they signed veteran, Gary Sheffield. The deal that hurts the most was letting Endy Chavez go to the Mariners. Chavez is a fantastic fielder and one of the best fourth outfielders in baseball. However in Seattle he will get more playing time. The Mets have the best bullpen in the National League. Led by closer, Francisco Rodriguez the new look Mets bullpen is not as good as it may seem but is still fantastic. J.J. Putz would be a closer on all but five teams and the Mets are one of them. This was a very smart move because now they have backup. When Billy Wagner got hurt last year and they had no other closers. Pedro Feliciano gave up one run about every 2.1 innings last year. Sean Green has been average in the past but I think he has a chance to be a pretty good player this year. Billy Wagner will be out till September and the Mets will then have a problem with three closers. All will want more playing time then the others but hey that it will be when the collapse happens. The Mets offense has its ups and downs. Last year Carlos Beltran, Carlos Delgado, and David Wright hit 98 combined home runs. This year Baseball Prospectus projects them as hitting 85 combined home runs. The main reason for this is that Carlos Delgado is predicted to hit 26 home runs rather then last years 38. David Wright will hit one lass home run. However I would not be able to mention the whole Mets offense if I did not say something about Jose Reyes. This guy is a fantastic contact hitter, one of the fastest guys in baseball, and is a good fielder. I see Reyes hitting fifteen home runs with a .320 batting average and stealing 70 bases leading the majors. I actually see the Mets having yet another collapse this one lead by starting pitching. I believe Johan will get hurt making Oliver Perez the ace. That would put Tim Redding in the rotation and I believe that signing was smart and stupid because it looks like they will need it but Redding is not the best pitcher to say the least. Mike Pelfrey is overrated and should be fourth in the rotation behind Perez, Johan, and John Maine. Maine I believe will get hurt in September meaning that Freddy Garcia will have to join the rotation. Livan Hernendez is underrated to me but he will blow up in September leading some people like me to think he might be a little overrated. Freddy Garcia is well on some days off the others. Most of the time he is off though. Billy Wagner is the only reason that the Mets will make the playoffs though. The Mets will barely make October but once they are their they will dominate. Their bats will pick up a ton and their pitching will get a little better by the return of John Maine. The Mets have a chance to go all the way and they very well could and can. The Mets though will need to make a trade for some pitching. The Mets should trade for Jake Peavy. That would but them in front of the Phillies and Braves in every way. That would mean no collapse this year and the Mets would go to the World Series. A day after the Braves lost out on Ken Griffey Jr. Tom Glavine resigned with the Atlanta Braves today on a one year deal. The contract is mostly made of incentives which gives the left hander the chance to earn up to $4.5 million dollars. He will get one million dollars no matter what. Glavine has played with the Braves on two different occasions and the New York Mets once. Glavine in college Glavine was a two sport star in baseball and ice hockey. He was drafted by the NHL’s Los Angeles Kings in the fourth round, 69th overall. In the MLB Glavine was drafted by the Braves in the second round. Glavine thankfully opted to play baseball and not hockey. Glavine got his first win against the Pittsburgh Pirates. In the game he hit Barry Bonds in the back. Years later Bonds broke Hank Aaron’s home run record the same weak Glavine got his 300th win. In 1991 Glavine won his first Cy Young award going twenty and eleven with a 2.55 ERA and 192 strikeouts. In 1991 he led the Braves to the World Series. The Braves lost though to the Twins four games to three. In 1992 the Braves made the World Series but lost to the Toronto Blue Jays four games to two. In 1993 Greg Maddux was traded from the Chicago Cubs to the Braves. He, Glavine, and Jon Smoltz formed on of the best starting rotations of all time. From 1991 to 1993 he became the last pitcher in baseball to win twenty games in three consecutive seasons. In 1995 the Braves made the World Series and beat the Cleveland Indians four games to two. Glavine was award the series MVP. The next year in 1996 the Braves faced the Yankees and ost four games to two. In 1998 Glavine won his second Cy Young award going twenty and six with a 2.47 ERA and 157 strikeouts. In 1999 he went to the World Series yet again and lost to the Yankees four games to zero. In 2003 Glavine signed a four year $42.5 million with the Braves rival, the New York Mets. In 2003 Glavine had such a bad year that I am sure he doesn’t want me to mention it. He did though get to play with his brother, Mike after the Mets called him up. In 2004 he made the all-star game and lost some of his teeth by getting in car wreck. The wreck happened while he was in a taxi. In 2006 he preformed like his old self going fifteen and seven and made the all-star game. The Mets also won the National League East. That postseason he went two and one in three games. In 2007 Glavine resigned with the Mets. Going into the 2007 season he needed only ten wins to get to the 300 mark. On August 5 he won his 300th game beating the Chicago Cubs on ESPN. Glavine became the 23rd 300 game winner and the fifth lefty to get to 300. At the end of the season Glavine declined an option and became a free agent. Last year Glavine pitched in only thirteen games going two for four. The Griffey signing put the Mariners back in the weak A.L. West. Now the Glavine signing puts the Braves back into a strong N.L. East. Glavine will most likely be the fifth man in the rotation and if he gets hurt he has Tim Hudson to fill in. Glavine is a ten time all-star who has won won four silver sluggers. With Glavine’s injury history the only thing we can be sure on is he is a hall of famer. Okay I was about to start a Young Guns for the Brewers when I saw Trot Nixon’s name on the roster. At first I thought it was a different one then I clicked on him and it was the same guy! 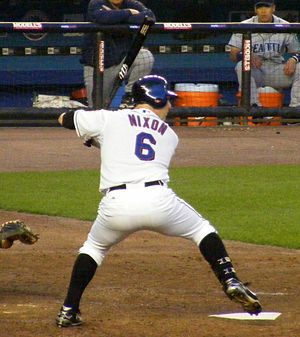 Trot Nixon was drafted by the Red Sox with the seventh pick in the 1993 MLB draft. He paved the way for Red Sox to wear go-tees (your welcome Youk 🙂 during the eleven seasons he spent in Boston. On September 21, 1996 he made his major league debut with the Red Sox. He became the starting right-fielder in 1999. That year he hit .270 with fifteen home runs, 103 hits, 52 RBI’s, and three stolen bases. 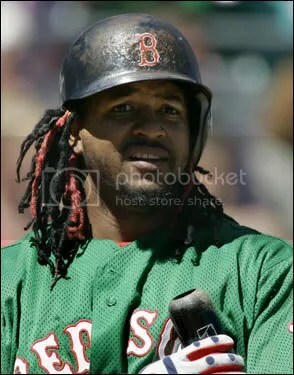 In 2001 he had his breakout year with Boston hitting .280 with 88 RBI’s, 27 home runs, 150 hits, and seven stolen bases. Two years later in 2003 he had his best season ever batting .306 with 87 RBI’s, 28 home runs, 135 hits, and four stolen bases. The next year he helped the Red Sox come back against the Yankees in the ALCS going six for 29 with one home run and three RBI’s in that series. In the World Series he helped Boston sweep the Cardinals going five for 14. He only played in 48 games because he had a herniated disc. His carer then became a downward spiral after that. In 2006 he had only eight home runs and 102 hits. Nixon was not offered salary arbitration and the Red Sox signed J.D. Drew to take the right field spot. 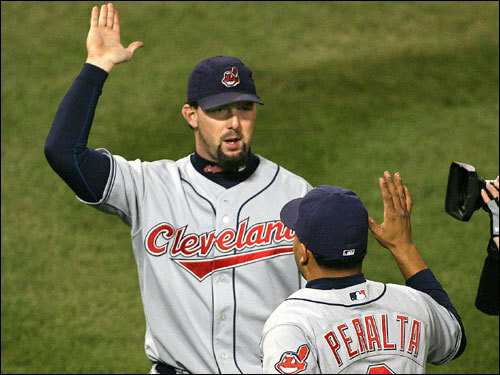 In January 2007 he signed a one year three million dollar deal with the Cleveland Indians. He batted .251 with three home runs that season. In the 2007 ALCS Nixon faced of against his former team the Boston Red Sox. Through the first four games Cleveland had a big lead three games to one but we all know how that season ended. The Red Sox came back to win the series and then sweep the Rockies in the World Series. In the ALCS he went three for seven with one RBI. In the 2008 offseason he signed a minor league deal with the Arizona Diamondbacks. On June, 13 he was traded to the New York Mets for money. In 2008 he batted .171 with one home run, one RBI, one stolen base, and six hits in 35 at bats. On December 18 he signed a minor league deal with the Brewers with an invitation to spring training. It is very unlikely that he will get a starters sport since Ryan Braun, Mike Cameron, and Corey Hart are all in the outfield but he could get the role of the forth outfielder beating out Tony Gwynn Jr. Nixon is now 34 years old. This story shows how stardom doesn’t not last. Just like Andruw Jones. One minute you could be a star the next a nobody. So Mr. Nixon and Mr. Jones I hope you prove me wrong by having a great season. First before I begin I know nothing about style like the pink hats. Why would I, Bob wear a pink hat. I know nothing about style unless it has to do with a baseball cap and a Red Sox jersey. I have no future in fashion. No the real reason I’m blogging about this is due to a blog, Girly Baseball Chick: A’s All the Time. Not a bad read if you haven’t checked it out yet. She talked about the pink hats. I support the pink hats. Yes, their not the team colors but their different. Sometimes people just want something different. Wouldn’t it be kind of boring if the only hat you could find was a green and gold A’s hat or a white and blue Padre hat? I know one of my readers, Julia wears a pink Red Sox hat. I can not stand the all white hats though you can’t see the logo or anything. That is why I support the pink hats. Another thing I support is the green Red Sox uniforms. Yes the Red Sox colors are red and dark blue but the green is cool. Now I don’t mean to say I want the Red Sox to change their name to the Green Sox just wear the cool green hats and jerseys a little more. The only reason they wear the green uniforms is because of the Boston Celtics, the NBA team in Boston. When Kevin Garnett threw out the first pitch at Fenway Park the Red Sox wore their green uniforms. When the Celtics won the NBA championship the Red Sox wore the green uniforms. As you see the green uniforms is just showing respect to the Celtics. Even Manny liked them. Another thing I like are the style caps. Some people say that only thugs were them. That is not true those are so cool. I don’t have one though. One game players should play with style caps. Their just so unique and different then the one we see David Ortiz, Ryan Braun, David Wright, and Andre Ethier wear on the fields. Another cool style cap are the stars and strip caps. They wore them on 9-11. I also think they wore them on the Fourth of July but I was at summer camp then. I really think the Blue Jay Canada hat. Those are so random, awesome, and cool. I bought one for no reason. I know it was a waist of money. I mean like I said about the pink hats sometimes people just want something different. Like the flat lids. I love those. My Red Sox hat has a flat lid. I only can think of one person who wears a flat lid, Joba Chamberlain who plays for the Y-. I told you I don’t like to say the Y word in my blog.